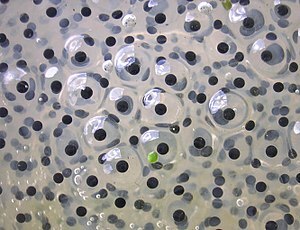 Most of the more than 6,000 species of frogs in the world lay their eggs in water. But many tropical frogs lay their eggs out of water. This behavior protects the eggs from aquatic predators, such as fish and tadpoles, but also increases their risk of drying out. Justin Touchon, post-doctoral fellow at the Smithsonian Tropical Research Institute, discovered that climate change in Panama may be altering frogs’ course of evolution. By analyzing long-term rainfall data collected by the Panama Canal Authority, Touchon discovered that rainfall patterns are changing just as climate-change models predict. The eggs of the pantless treefrog, Dendropsophus ebraccatus, are extremely susceptible to drying. The embryos die within a day when there is no rain. Heavy rains trigger breeding, so as storms become sporadic, the chance of rain within a day of being laid decrease and so does egg survival.